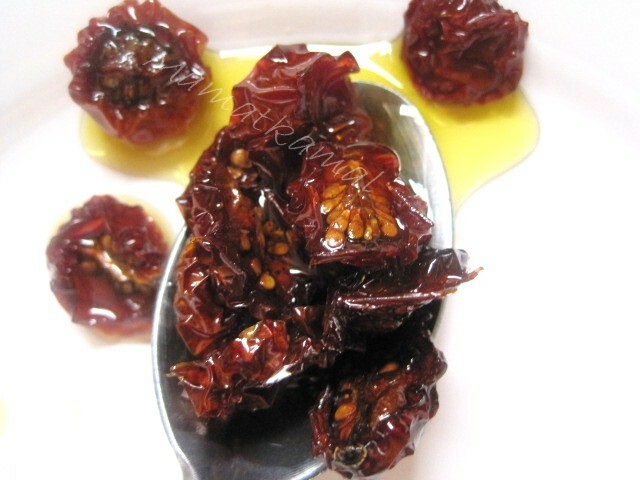 Dried-Tomatoes are born in Italy as a way to store tomatoes for the winter. They are an easy way to use your excess tomatoes in your garden, and they add a gourmet touch to so many dishes. 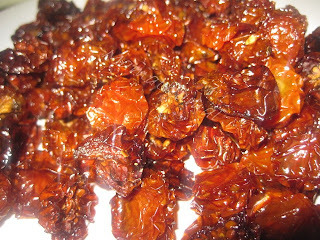 Unfortunately their price in the stores is so exorbitant and our cooking may get very expensive if we use dried tomatoes so often. I wish I could make Sun-Dried Tomatoes but I don't live in a climate that makes that the best method, so I dried mine in the oven. This is a recipe passed to me by my colleague and friend Lori, except for my addition of ground black pepper, cumin and dried coriander. Thank you so much! When I tasted those dried tomatoes, I took my first bite and immediately I was blown away by the delicious taste. They were just brilliant! The flavour was excellent, heightened by coriander, black pepper and cumin, something I have never found in those expensive regular bottled sun-dried tomatoes. Immediately, I thought to use them to top my vegetarian pizza for dinner and for my green cheese salad, but I couldn't stop snacking those little babies and I was afraid, they won't be enough for my pizza or even for my salad! They were just delicious on their own! My friend told me they will shrink in the oven but I didn't know they will shrink that much, i.e. almost three-quarters of their original size. 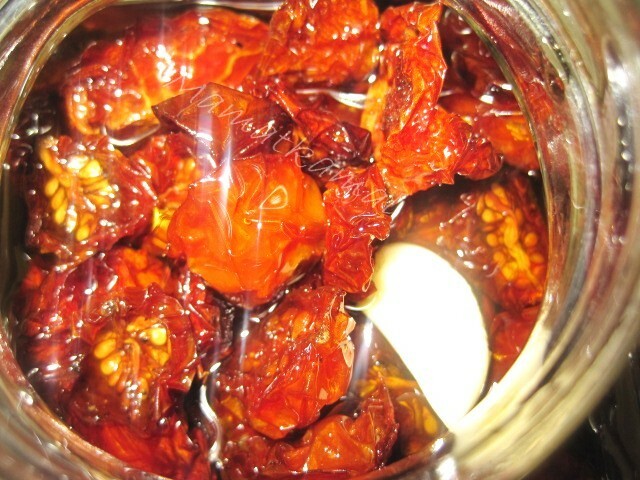 I dried about 1 kg of tomatoes, it was just enough to fill my 200 ml jar. Next time, for sure, I will use 4 kgs and more, and I will add either garlic powder or fresh chopped garlic to the tomatoes before drying them. 1-Preheat oven at 90°C fan / or 110°C / or 225 °F / or gas mark 1/4. / Préchauffer le four à 90°C, équipé de système de ventilation / ou 110°C / ou 225 °F / ou 1/4 th. 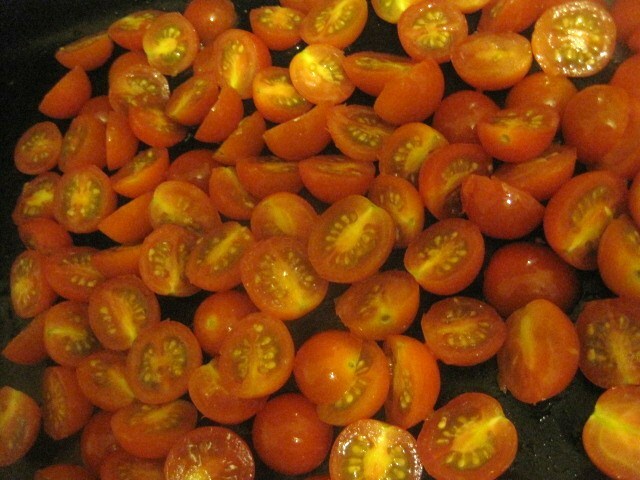 2-Wash tomatoes and halve each one lengthwise. / Après les avoir lavé, couper les tomates en deux dans le sens de la longueur. 3-Arrange the tomatoes, the cut side up on an open rack. / Placer-les dans une plaque, partie arrondie dessous. 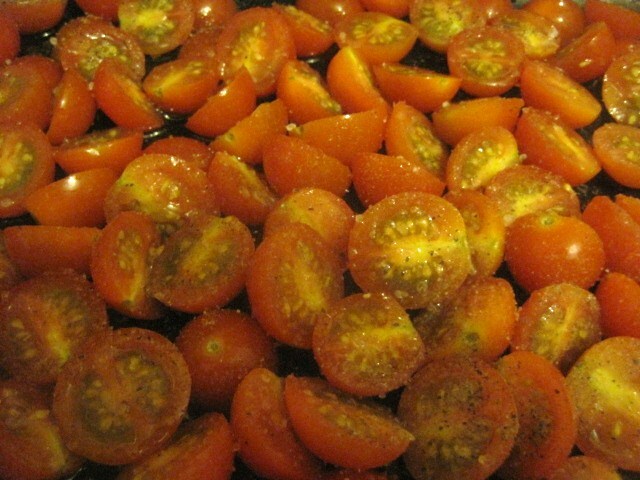 4-Combine salt, cumin, dried coriander, freshly ground pepper and sprinkle over tomatoes. Drizzle olive oil over them. / Dans un bol mélanger, cumin, sel, coriandre séchée, poivre noir fraîchement moulu et saupoudrer les tomates de ce mélange d'épices , puis arroser-les d'huile d'olive. 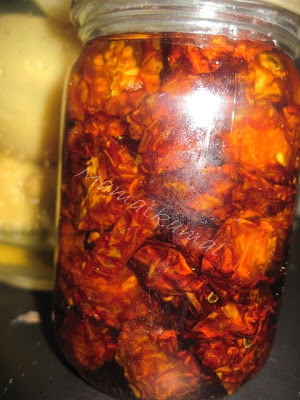 5-Dry them for about 6 to 8 hours. / Faire sécher pendant environ 6 à 8 heures. N.B. 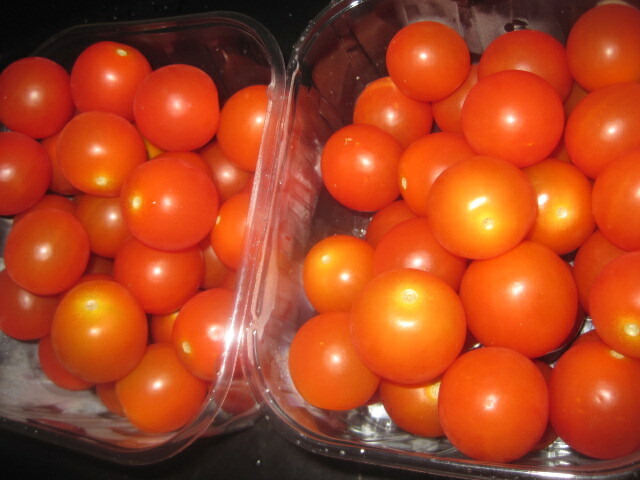 : Make sure to check the tomatoes from time to time, smaller ones will dry more quickly! / Enlever au fur et à mesure les tomates qui sont séchées à point. Les plus petites ont l'air de sécher rapidement! 6-Place the tomatoes in a sterilized glass jar, cover it with some olive oil, add 1 or 2 cloves of garlic or other herbs you like and store in the fridge. / Les disposer dans un bocal en verre stérilisé, couvrir les tomates d'huile d'olive, puis ajouter 1 ou 2 gousses d'ail et autres épices ou fines herbes à votre goût. Ranger au réfrigérateur. 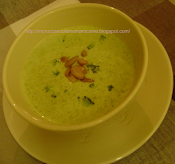 Interesting recipe.. looks gr8.. thanks for sharing !! Muy buena receta,los tomates secado al sol en forma natural son exquisitos ,gracias por mostrarnos esta receta muy buena y linda,cariños y abrazos. Love this idea and it is a real cheap alternative for sure. 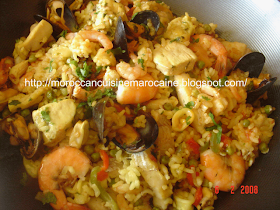 I find the taste so intense and concentrated to, will bring zing to any dish. tbarkellah 3lik khadija,à tester inchallah,machi 6 heure bezzaf ola darte 160c°ghadi ndir ghire 3 heure? ?